The 1:7,500 scale (vertical 1:2,900) 3D model of Yok Don National Park was completed in April 2003 in Dak Lak Buon Don District, Commune of Krong Na, Vietnam. It was produced by local stakeholders in the framework of the PARC Project. PARC is co-financed by the Global Environmental Facility (GEF) and the United Nations Development Programme (UNDP/TRAC). PARC was implemented by the Forest Protection Department (FPD) of the Ministry of Agriculture and Rural Development and the United Nations Office for Project Services (UNOPS). 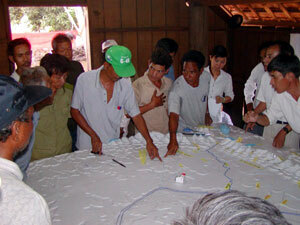 IUCN – The World Conservation Union provided technical assistance at the national level and Scott Wilson Asia – Pacific Ltd. provided technical assistance at the site level. The model covers a total area of 225 km2 and was built to determine boundary delineation and resource within the park enclave of Drang Phok. Depicted data reflect the cognitive maps of village elders and village chief, representatives from the Forest Protection Department of Yok Don National Park, Agriculture and Rural Development Office, Tay Nguyen University, Commune and District government, Krong Na Extension Club. Women’s Union, and Farmer’s Union. Yok Don National Park was established on 20 October 1991 in Buon Don District of Dak Lak Province. The aim was long-term protection of an area of 58,200 hectares, 92% of which is covered with dry deciduous forest, making it the only national park in Viet Nam conserving this particular forest type. Subsequent scientific research proposed the expansion of the park to the north to include further areas of biological importance. As a consequence on 18 March 2002 the boundary was redefined to include the village of Drang Phok, which has been inhabited for more than a century. A tentative agreement was reached on delineation. Verification of understanding of the various implications needed. Tentative agreement is not legal, but basis for further discussion. 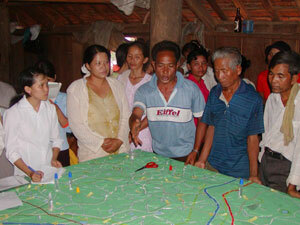 A common understanding of the broad development approach of the enclave has also been reached. To be developed further in a village development plan.